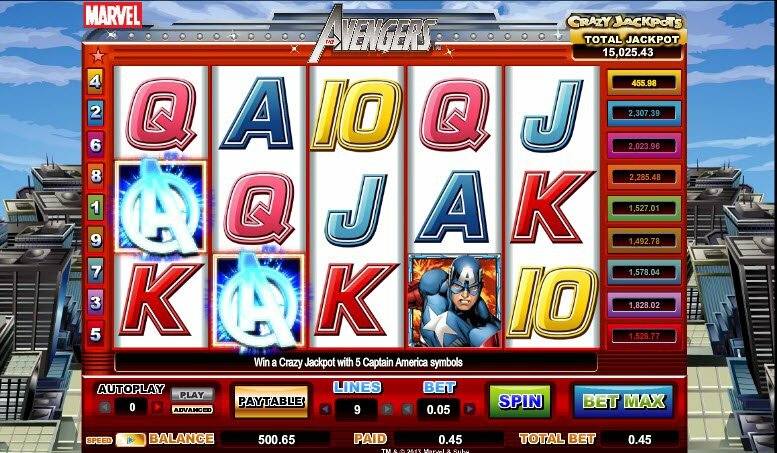 The Avengers slot by Cryptologic takes some of our favourite Marvel characters and adds prizes, jackpots and multipliers to get you spinning and winning. The character animations show their biggest strengths and the bonus features are very playable and a great addition to helping you win. Captain America is the true hero of the Cryptologic slot, offering us the chance of 9 different Crazy Jackpots. Crazy Jackpots line The Cryptologic Avengers slot machine game. 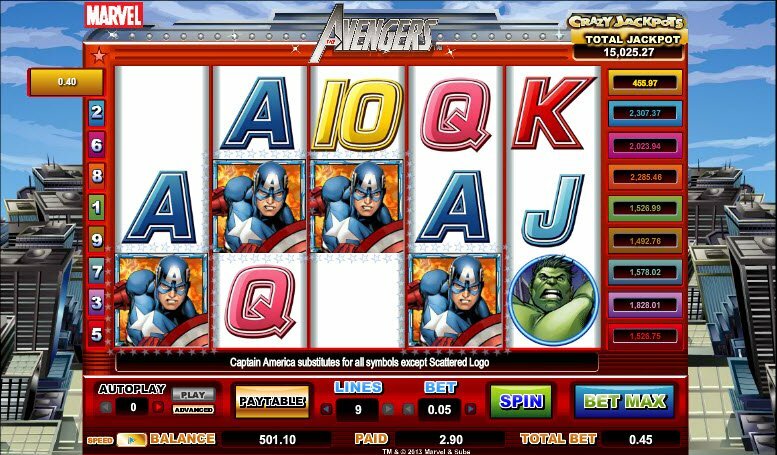 There is a Jackpot available on each of the 9-paylines and it’s a standard 5-reel video slot, featuring The Avengers from Marvel Comics. The fanfare that accompanies the Cryptologic Avengers slot graphics starts the game off nicely. Graphics are simple, colourful and they definitely do resemble the characters we know and love. When you spin Iron Man, The Hulk, Thor or Captain America and get a payline or two, they animate and we see each using their own special skill to help avenge the people, while they bring justice and make right what has gone wrong in the world. Thor's mighty hammer also stars in the Cryptologic Avengers video slot machine game, bringing bags of coins and luck when spun on all 5-reels. Captain America, a true hero, is the wild symbol, a symbol that substitutes for all other symbols in order for you to win on the Cryptologic Avengers slot. The reassuring whirring of the reels and ensuing thud, as your winning Cryptologic Avengers slot paylines come in, adds excitement to the game in my opinion, upping the anticipation of winning one of those Crazy Jackpots. Captain America, a true hero, is the wild symbol, a symbol that substitutes for all other symbols in order for you to win on the Avengers slot by Cryptologic. The Avengers logo, a silver letter A in a silver circle that looks like it's jumping out to run to someone's rescue is our scatter symbol that will lead you to the Cryptologic Avengers slot Bonus Feature. When hit, logos will appear for you to click on and reveal what prize hides beneath, multipliers are amongst the most frequent to be uncovered. 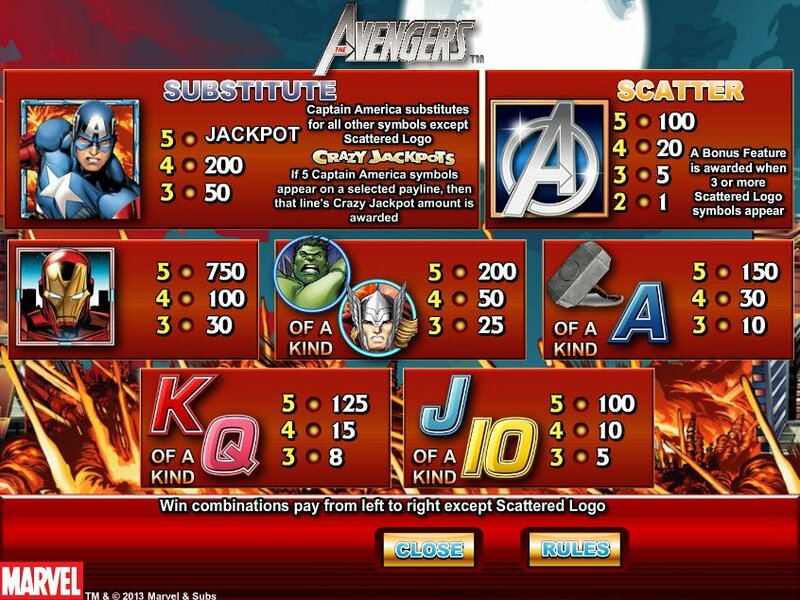 A very special bonus feature is The Cryptologic Avengers slot jackpots. With one waiting to be won on each payline, you'll be feeling as world renowned as Captain America once you see his face staring out at you from all 5-reels.